What is the likelihood that these factors could come into play in Europe and Russia? To answer that question, it is necessary to take a closer look at the conditions that caused Ebola to take hold in West Africa and how these conditions compare to those in Russia and Europe. There are four main reasons why today’s Ebola epidemic has reached an unprecedented scale. The first reason is the natural concentration of the Zaire ebolavirus (the formal designation of Ebola) in West Africa, at the crossroads of Guinea, Liberia and Sierra Leone. The second is a lack of reliable information about the circulation of Ebola in those places both in those countries and in the broader global community until the beginning of 2014. The third is the complex socio-economic environment in West African countries, and the fourth is the plethora of local customs that facilitate the spread of communicable viruses. Do we need sanctions against Hemingway and Tolstoy? There are three main types of Ebola outbreaks. The first is the forest type, when whole forest villages are infected with the virus and die. In these situations, fruit bats, which are natural transmitters of the Zaire ebolavirus, infect monkeys or other wild animals, and these newly infected animals are hunted by locals, who bring the bush meat back to the village to eat. The fruit bats themselves are also a popular dish in the region. 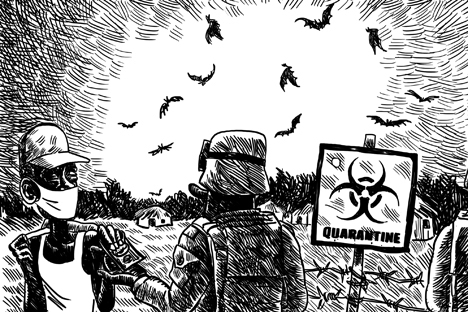 In the end, Ebola infects the entire settlement. In conditions of overcrowding and a lack of proper treatment, mortality can reach 90 percent. The second type of Ebola epidemic is rural. The behavior of the fruit bat changed when tropical fruit plantations began to spread right up to the edges of forests. The animals began to feast on fruit not in the forest, but on plantations. And the plantations attracted a higher concentration of people. As a result, the risk of infection skyrocketed. It is likely that patient zero – the person from whom the current epidemic originated – came from near a plantation. As far as we know, in this outbreak, Ebola patient zero was a two-year-old boy who died on Dec. 6, 2013. After this, the infection began to spread and took on the characteristics of the city type of Ebola epidemic. This type of outbreak occcurs when the virus is transferred through direct contact with the biological fluids of sick people. Unlike other diseases, such as the flu, Ebola is not transmitted by airborne droplets, which generally makes it harder to spread – but this is where the particular conditions of life in West Africa comes into play. Much of the population of West Africa is very poor. The cities are covered in trash heaps, including along the main street of Conakry, the capital of Guinea. Sewage flows along large streets where trash is also discarded and people bathe. The healthcare system in the region is in its infancy, and there is simply no sanitary and epidemiological control. Even before the Ebola epidemic, child mortality in the region was 118 per 1,000, and adult mortality is also extremely high. Another contributing factor to the spread of Ebola is local funeral customs. In the region, when a person is being buried, all of his or her relatives wash and hug the body of the deceased. Naturally, everyone involved in the ceremony could be exposed to infection because the virus is transmitted via direct contact with bodily fluids. The pull of these traditions is very strong, and illiteracy and a general lack of education doesn’t help doctors who want to spread information about how to stay safe from the disease. It is easier for people to believe in established traditions – for example, that the deceased should be kissed before burial – than to accept that they could be infected with a deadly virus by doing so. It would be impossible for the disease to spread in the United States, Europe, and Russia on the scale that it did in West Africa. For one thing, these countries have solid systems for monitoring the evolution of epidemics, so even if the conditions for nurturing Ebola existed in Russia and Europe, they would be under constant control. Additionally, the socio-economic situation in Russia and other developed countries is completely different from that of West Africa. Additionally, Russia historically has an excellent system for ensuring biological security. For this reason, theoretically a similar situation could not arise in Russia. Even if Ebola were introduced in the country, it would only arise in sporadic cases, which would be discovered quickly, properly identified, and localized in the shortest possible time. But it should be clearly understood that the precautionary measures currently being implemented at airports — such as taking temperatures, surveying passengers — are necessary but insufficient to completely rule out the emergence of the virus in Russia and other countries. It is possible that an infected person could get through even the most thorough checks at airports. These checks will do nothing to stop the classic case of an imported virus, which is as follows: an infected person in the incubation period, without any clinical symptoms, crosses the border and gets sick in a new country. But I would like to note that Russia has on average 100-200 cases of imported viral infections every year, and none of them have had epidemic consequences. The same will be the case with Ebola. Mikhail Shchelkanov is the head of the laboratory of Virus Ecology at the Ivanovsky Institute of Virology of the Russian Minstry of Health. This summer, he helped fight Ebola in Guinea.